John, I want to answer to you! It's not effect on PS, it's real photo. 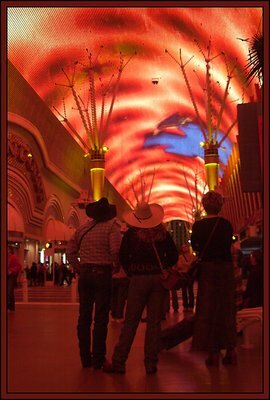 There is a special place in Los Vegas, where on a ceiling lights and colors changing and moving one after another. It's a huge place. It looks fantastic! I wanted to share it with everybody. Is than an effect of yours (PSed) or that are lights?!?!?!?! Surely impressive colours and surely something very interesting to present to us here. Best regards Elena! Have a great weekend! Hehe...very nice photo. I have one almost exactly like that, but not as nice. Congrats! Yes...another beautiful work! Regards, my friend!